This granola is a subtle celebration to fall. Served with yogurt or milk, it makes a great breakfast or snack. While it’s not overwhelmingly pumpkin flavored it has a warm spice that goes well with the colder weather. This is also the first granola recipe I’ve seen without coconut…anyone know why granola always has coconut in it? I didn’t miss it from this, but if you’re a coconut lover I’m sure it would be a delicious addition. In a large bowl, combine oil, salt, pumpkin pie spice, syrup and pumpkin puree. Whisk until smooth. Add oats, nuts, sesame seeds and wheat germ. Mix well. Line a large jelly roll pan with parchment paper and spread granola evenly. Bake until dry and golden, about 35 minutes, stirring every 15 minutes. 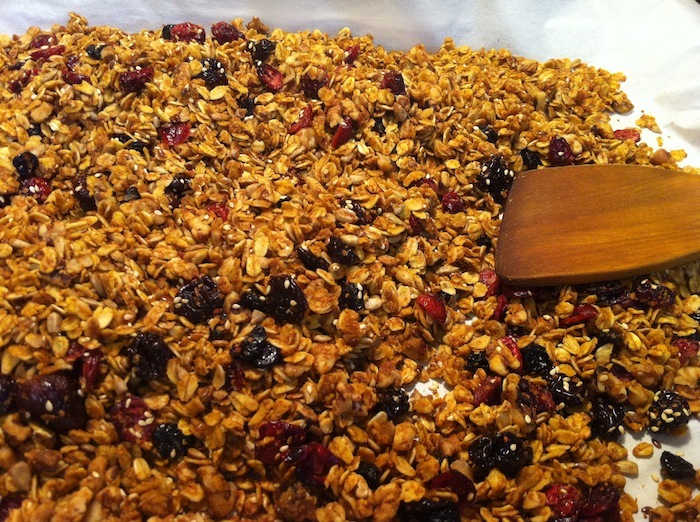 When granola is finished baking, mix in the dried cranberries. Cool completely and store in an air tight container.